I don’t eat regular hamburgers but, for some reason, that didn’t stop me from watching a Food Network special about the nation’s best burgers. On this particular episode of “The Best Thing I Ever Ate” Food Network celebrities shared their favorite restaurant burgers. The last one featured was a veggie burger from The Farm Cafe in Portland, Oregon. It looked pretty tasty so I thought I’d give it a go. The restaurant shares the recipe on their website although it seemed a tad basic for me. Here it is tweaked a little. First, roast your eggplant. Place the eggplant in a shallow pan and broil it about 4 inches or so from the heating element. Use the low setting if you have one. Keep an eye on the eggplant and turn it frequently. 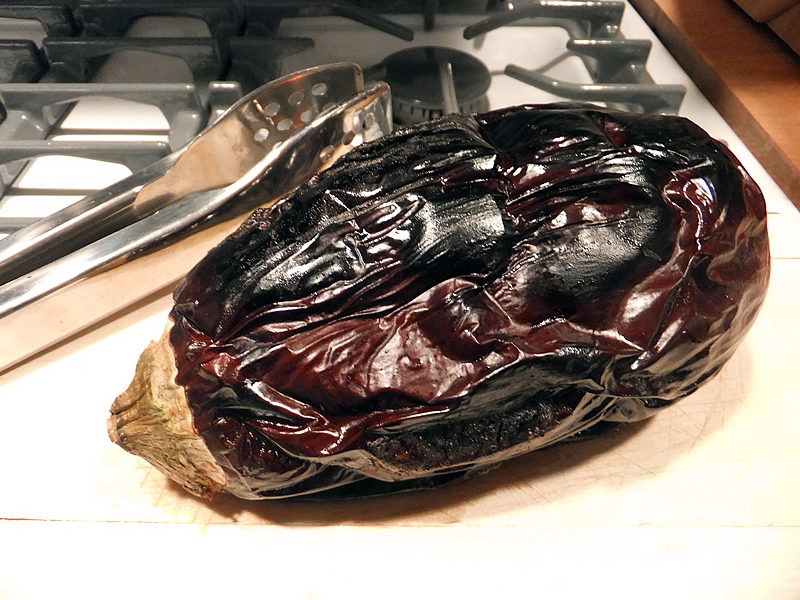 It may take up to a half an hour for the eggplant to be completed roasted. It should look like a black charred mess. Seriously. It’s also going to lose some liquid during the broiling process. That’s good because you don’t want a watery burger! When the eggplant is good and charred, remove it from the oven and let it rest while you prep the rest of the ingredients. Nicely charred skin means roasting is complete. Add about a tablespoon of oil to a medium size pan and saute the garlic and onion until soft, about 2 minutes. Peel all of the blackened skin away from the eggplant and discard. Roughly chop the eggplant and add it to the garlic and onions. Cook until the eggplant is nice and mushy, about 5-10 more minutes. Combine the bread crumbs, cheese, cilantro, salt and pepper in a medium mixing bowl. Add the prepared eggplant and mix thoroughly. Allow the mixture to sit in the refrigerator at least a half an hour. This is a good time to have a glass of wine. 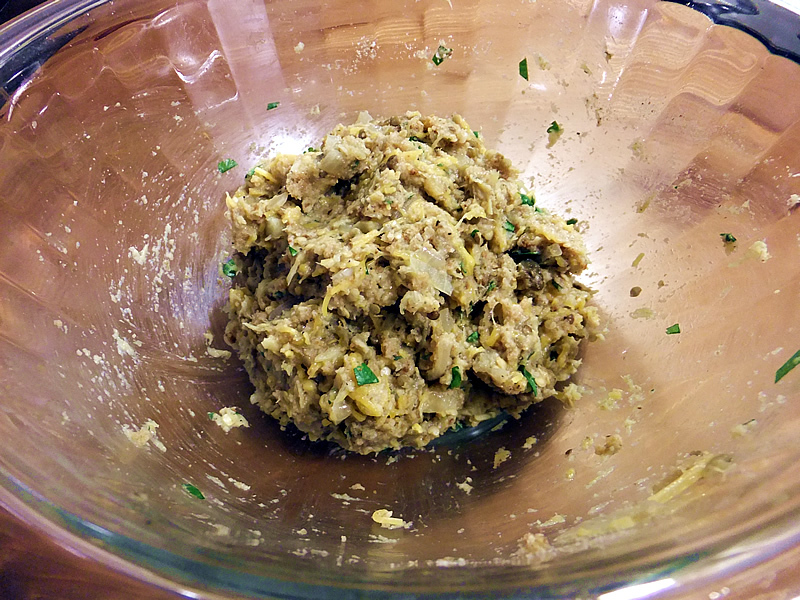 Once cooled, form the eggplant mixture into patties that are about an inch thick. You can make 2 giant burgers or divide the mixture up as you please. You are going to want to use a non-stick pan to cook the burgers in, trust me on this. Heat the remaining olive oil up to a nice sizzle in your non-stick pan and fry the burgers for about 5 minutes per side. Use medium heat. Your goal is to achieve a nice, crispy brown finish to the burgers without burning the heck out of them. My first attempt burnt to a crisp in a stainless steel pan. Round two turned out beautiful. Garnish the burgers with your choice of toppings. 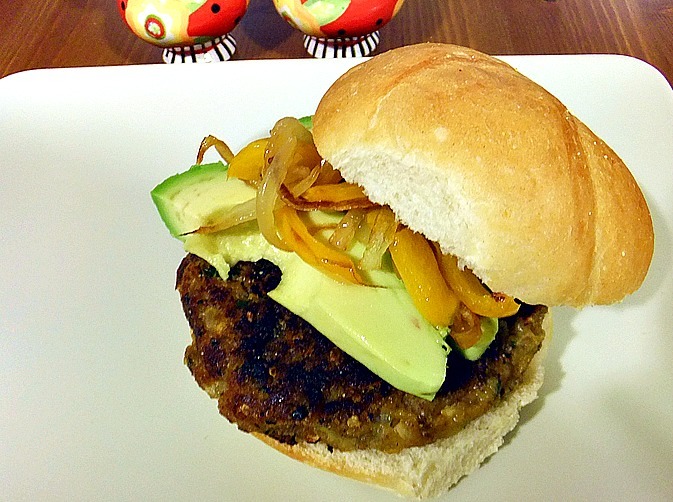 I used caramelized peppers and onions, and sliced avocado because I had those items on hand. This would also be fabulous with some roasted red peppers and fresh spinach.